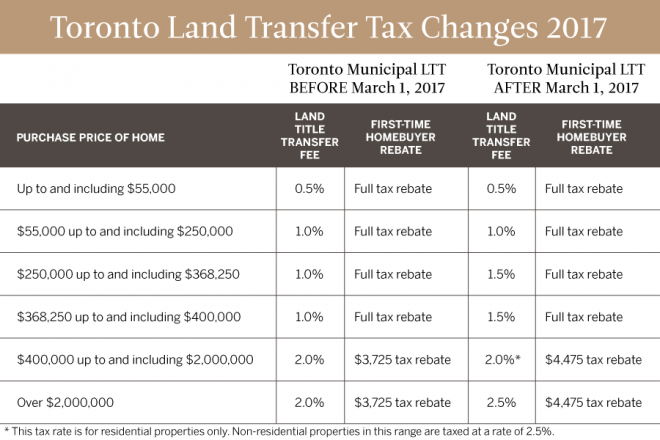 City of Toronto to Increase to Land Transfer Tax — Effective March 1, 2017 - Distinctive Advisors Inc.
On February 15, 2017 the City of Toronto Council approved changes to the Toronto Land Transfer Tax that mean additional Land Transfer Tax (LTT) costs for some home buyers with a closing date on or after March 1, 2017. As a result of TREB’s efforts, first-time home buyers will NOT see any change. Do you have the full picture of how municipal and provincial land transfer tax impacts Toronto real estate? Click here to view the breakdown of land transfer tax for Toronto homeowners. Toronto Land Transfer Tax — What’s New and What’s Coming?